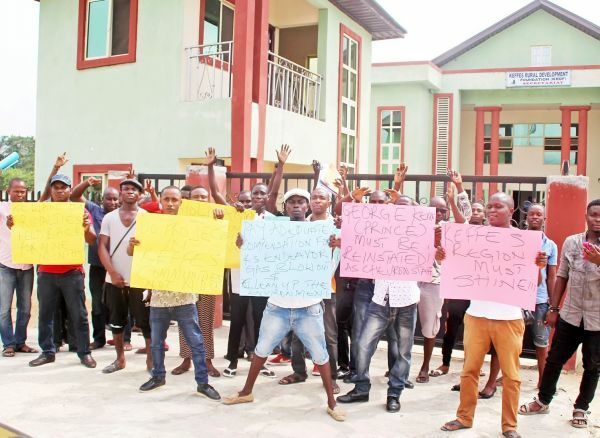 Ijaw youths, under the auspices of Ijaw Youth Council Worldwide, Central Zone, on Thursday shut down the activities of the headquarters of the Nigeria Content Development and Monitoring Board, Yenagoa, Bayelsa State. For over two hours, the angry Ijaw youths in their hundreds, locked down Yenagoa, the state capital, claiming that the NCDMB had opened new offices in Lagos and Abuja contrary to the provisions of the Local Content Act. The youths, who stormed the office complex, located along Isaac Boro Expressway at about 9:45am, had forced their way into the complex by pulling down a section of the fence when the security guards denied them access through the main gate. The Chairman, IYC, Central Zone, Tari Porri, who led the protest, said it had come to their knowledge that the NCDMB had opened new offices in Lagos and Abuja contrary to Section 71, sub-section 3 of the NCDMB laws. He stated that NCDMB Act empowered the Board to open offices in only in oil and gas producing areas, querying the board’s rationale for opening offices in Lagos and Abuja. Porri said, “This place has been left redundant and the Executive Secretary now operates from Lagos and Abuja and comes here only once in three months. This is unacceptable! The Executive Secretary should stay here with us. “The NCDMB laws stipulate that offices should be opened in only oil and gas areas, but the board has gone ahead to open offices in areas such as Lagos and Abuja which are not oil and gas producing areas. The state Commissioner of Police, Mr. Asuquo Amba, who had arrived the scene one hour after, commended the youths for their peaceful disposition. He urged them to remain calm as the state Governor, Seriake Dickson, was aware of their grievances and had promised to wade in the matter. Amba said, “I have to appreciate you for making this protest a very peaceful one, and I will still employ you to remain peaceful. But we should respect the sanctity of this place as the headquarters. ”I have listened to all your grievances. I am in touch with the state governor and I have spoken to him and if there is anybody to lead this protest, it is the state governor himself, but he has personally told me to come and address you, compile your grievances and forward them to him. Earlier, at a general congress, IYC Central Zone had suspended the President of IYC Worldwide, Mr. Owolaemi Peretubo, from all activities in the zone, accusing him of conniving with the NCDMB. The congress also condemned the killing of four soldiers and a civilian as well as the burning of houses in Letugbene, Ekeremor Local Government Area of the state where the military had launched a manhunt over the reported killing of their personnel.